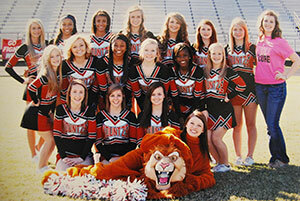 Yesterday marked a huge win for students’ religious freedoms, as the Kountze High School Cheerleaders secured a victory in their Bible banner case. These brave young women stood strong, proving that wonderful things can happen when you make the bold choice to stand for your faith. Last fall, Kountze ISD banned the high school cheerleaders from writing Bible verses on run-through banners at school sporting events. The Kountze superintendent made the decision after the district received a threatening demand letter from Wisconsin-based Freedom From Religion Foundation. Liberty Institute and our affiliated local attorney David Starnes were able to obtain a temporary injunction, allowing the student-made banners to continue. For the past several months, the cheerleaders faced an intense battle for religious freedom – a battle that included numerous hearings, many motions and pleadings, and days of intense depositions in which the young women endured hours of brutal questioning. Tuesday’s win follows seven months of litigation. This victory was also made possible by the help of the Texas Attorney General. Liberty Institute is proud of these young women for taking a bold stand, and we are thankful to our loyal supporters – you helped secure this win for religious freedom. Your continued prayer, your willingness to share this story with your friends and family, and your generous financial support has enabled Liberty Institute to stand with cheerleaders as they bravely fought for their First Freedom. While we do pause to celebrate this victory, our work is never done. The fight to protect religious freedom in our schools continues, and our opposition is growing more aggressive by the day. Please consider a gift today to help us continue to defend the constitutional rights of students throughout the country that are facing religious discrimination. About Liberty Institute Liberty Institute is a nonprofit legal group dedicated to defending and restoring religious liberty across America — in our schools, for our churches and throughout the public arena. Liberty’s vision is to reestablish religious liberty in accordance with the principles of our nation’s Founders. For information, visit www.LibertyInstitute.org.